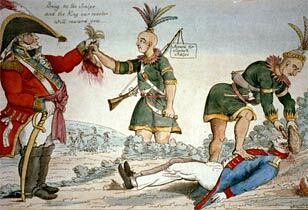 "A scene on the frontiers as practiced by the 'humane' British and their 'worthy' allies," this cartoon from the War of 1812 might just as easily have been created during the American Revolution, when Americans similarly accused the British of inciting Indians against them. Original attributed to William Charles, 1812. Library of Congress, Prints and Photographs Division, LC-USZC4-4820. "HE has excited domestic Insurrections amongst us, and has endeavored to bring on the Inhabitants of our Frontiers, the merciless Indian Savages, whose known Rule of Warfare, is an undistinguished Destruction, of all Ages, Sexes and Conditions." The Seminoles, just one of the tribes alluded to, concentrated their "undistinguished Destruction" on the frontier plantations of Georgia and Alabama. During the fighting they solidified ties to the British, but even more importantly, they deepened ties to black fugitives. In some cases, blacks and Indians fought side-by-side against the Americans. In the East Florida Rangers, for example, southeastern Indians, fugitive slaves, and British Loyalists jointly raided and pillaged American plantations.